If you're looking to save on a used Toyota model, come to Eddy's Toyota. We don't just get old models and list them for sale. We put every vehicle through a stringent inspection, making restorations and repairs as needed. At Eddy's, near Hutchinson and Emporia, our inventory is stocked with recent and classic Toyota trade-ins for you to choose from. In 1996, Toyota launched the Toyota Certified Used Vehicles (TCUV) program. Our factory-trained technicians perform a 160-point inspection on each model. Then we give every used Toyota we sell a warranty, certifying it as ready for re-sale. Since the TCUV program was established, over three million used Toyota models have been sold in approved like-new condition. Each used Toyota model from Eddy's Toyota, near Hays and Salina, comes with an exceptional coverage policy. We offer a 12-month/12,000-mile Comprehensive Warranty, a 7-year/100,000-mile Limited Powertrain Warranty, plus one full year of roadside assistance. Our professional technicians want to keep your vehicle running at its best for years to come. 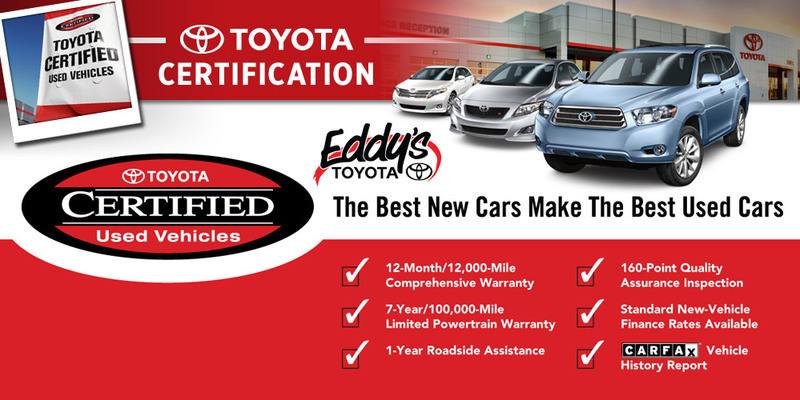 Eddy's Toyota is proud to offer a fantastic selection of certified used Toyota vehicles. When you're ready for a test drive, schedule online or give us a call at (316) 618-2332. Check with our financing experts on how to find something to match your budget and lifestyle needs. Eddy's Toyota also serves the Oklahoma area of Tulsa and Enid, and is located at 7333 E Kellogg, Wichita, KS 67207. We hope to serve you soon! Want Us To Find You a Toyota Certified Vehicle?